Yahoo Sports is celebrating its 21st anniversary this year. Fantasy sports date back decades, yet the novelty has never worn off. In fact, 92 percent of fantasy interactions occur on mobile today, an increase of 263 percent since 2016, according to research from Oath. Ever since Yahoo Sports launched 21 years ago, the Oath business has worked with brands on connecting with consumers around fantasy sports. And major marketers keep coming. This year, Lexus has decided to partner with Yahoo Sports for the first time on fantasy football. The automaker is launching a custom takeover of Yahoo Sports’ new show, The Spin, in October, which will include video ads running alongside other programs. "We know that football is a passion point for Lexus customers. Given the timing for the debut of the all-new ES, the partnership presented a unique opportunity to align with one of the largest and most engaging fantasy sports platforms," said Cooper Ericksen, Lexus’ vice president of marketing. He added that the goal is to build greater awareness of Lexus and the 2019 ES among an engaged and targeted audience. Following the program, Lexus plans on conducting a brand lift study to measure the increase in brand awareness, affinity and perception attributed to the campaign. Universal Pictures is also onboard as a Fantasy Football advertiser this year. 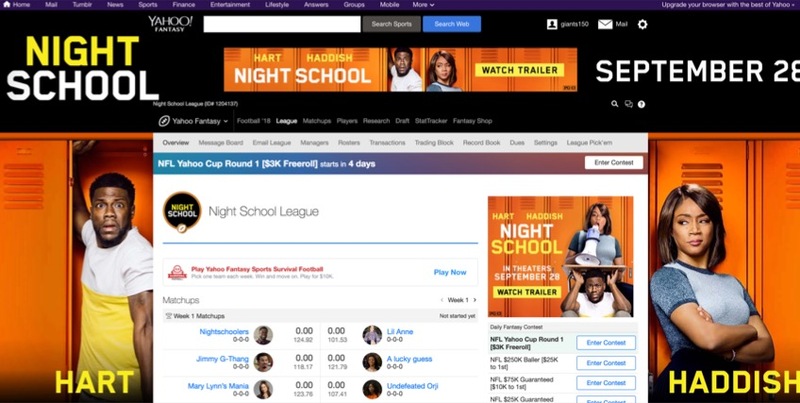 The company is promoting the movie "Night School and had the entire cast create a Yahoo Fantasy Sports League. "Yahoo Sports is the dominant platform for football fans and for fantasy football leagues, armed with a massive consumer reach, so it was an ideal partner for the launch of Universal’s new Kevin Hart-Tiffany Haddish comedy, Night School," said Doug Neil, executive vice president of digital marketing for Universal Pictures. He added: "Fall in America means both back-to-school and back-to-football, so the kickoff of Yahoo Sports proved to be both the right place and the right time to help us introduce Night School to a broad, diverse audience." 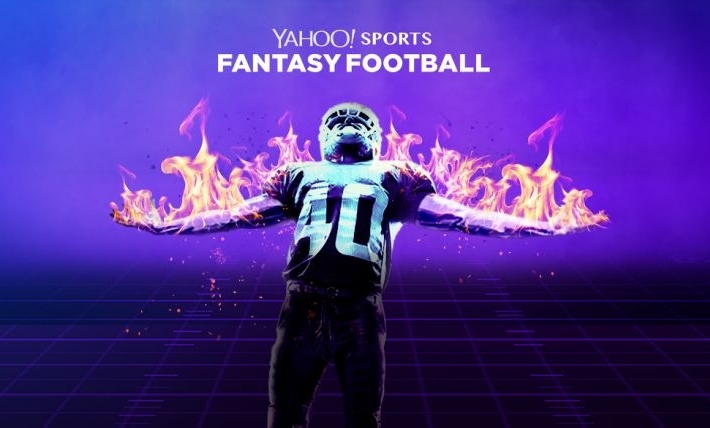 Jeff Lucas, senior-VP and head of Americas sales at Oath, told Campaign that Yahoo Sports differentiates from other fantasy competitors because of its "innovation and integration." He said the company leverages the latest ad formats and premium video available to jumpstart campaigns. Oath’s "Mobile Moments" format, which engages consumers with full-screen native ads and interactive storytelling, has led to an average 12 seconds of dwell time – two times the industry average of native ads, claimed Lucas. Yahoo Sports also works with advertisers to integrate content in relevant ways across its platforms. "Our goal is to continually enhance the Yahoo Sports Fantasy Football user experience and ultimately build brand love, not just for a property like Yahoo Sports but for our advertisers," added Lucas.